COATINGSPRO MARCH 2015 57 fnished in the feld. And the coating system that was chosen, also called R AM-100, was a two-part epoxy manufactured by the crew's parent company. Tis crew had an intimate understanding of the product, and they'd need to have a close understanding of the pipe's intended site, too. "A detailed study was necessary for the Right of Way for the new pipeline due to the close location of the proposed design to other existing parallel pipelines in certain sections," Candia explained. 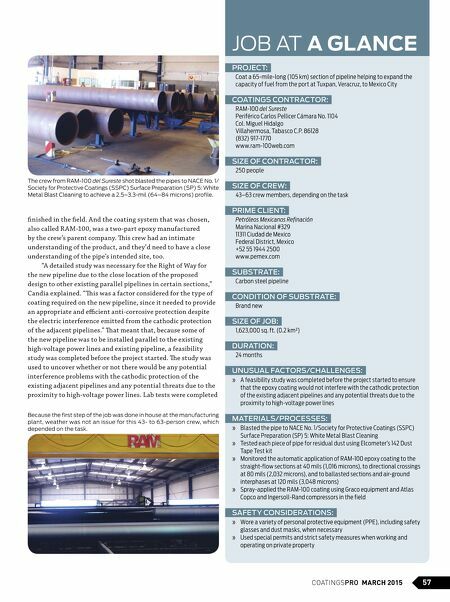 "Tis was a factor considered for the type of coating required on the new pipeline, since it needed to provide an appropriate and efcient anti-corrosive protection despite the electric interference emitted from the cathodic protection of the adjacent pipelines." Tat meant that, because some of the new pipeline was to be installed parallel to the existing high-voltage power lines and existing pipeline, a feasibility study was completed before the project started. Te study was used to uncover whether or not there would be any potential interference problems with the cathodic protection of the existing adjacent pipelines and any potential threats due to the proximity to high-voltage power lines. Lab tests were completed The crew from RAM-100 del Sureste shot blasted the pipes to NACE No. 1/ Society for Protective Coatings (SSPC) Surface Preparation (SP) 5: White Metal Blast Cleaning to achieve a 2.5–3.3-mil (64–84 microns) profile. 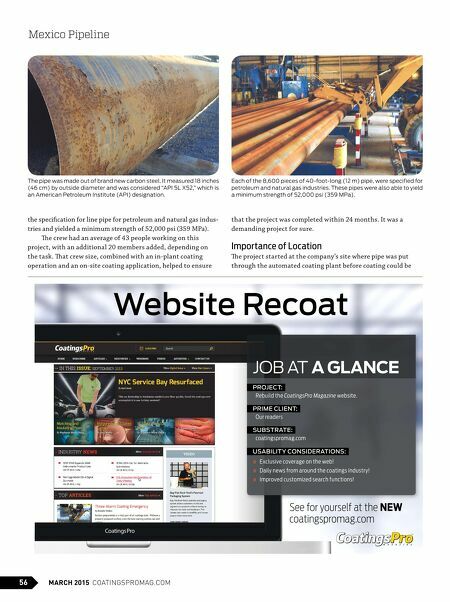 JOB AT A GLANCE PROJECT: Coat a 65-mile-long (105 km) section of pipeline helping to expand the capacity of fuel from the port at Tuxpan, Veracruz, to Mexico City COATINGS CONTRACTOR: RAM-100 del Sureste Periférico Carlos Pellicer Cámara No. 1104 Col. Miguel Hidalgo Villahermosa, Tabasco C.P. 86128 (832) 917-1770 www.ram-100web.com SIZE OF CONTRACTOR: 250 people SIZE OF CREW: 43–63 crew members, depending on the task PRIME CLIENT: Petróleos Mexicanos Refinación Marina Nacional #329 11311 Ciudad de Mexico Federal District, Mexico +52 55 1944 2500 www.pemex.com SUBSTRATE: Carbon steel pipeline CONDITION OF SUBSTRATE: Brand new SIZE OF JOB: 1,623,000 sq. ft. (0.2 km²) DURATION: 24 months UNUSUAL FACTORS/CHALLENGES: » A feasibility study was completed before the project started to ensure that the epoxy coating would not interfere with the cathodic protection of the existing adjacent pipelines and any potential threats due to the proximity to high-voltage power lines MATERIALS/PROCESSES: » Blasted the pipe to NACE No. 1/Society for Protective Coatings (SSPC) Surface Preparation (SP) 5: White Metal Blast Cleaning » Tested each piece of pipe for residual dust using Elcometer's 142 Dust Tape Test kit » Monitored the automatic application of RAM-100 epoxy coating to the straight-flow sections at 40 mils (1,016 microns), to directional crossings at 80 mils (2,032 microns), and to ballasted sections and air-ground interphases at 120 mils (3,048 microns) » Spray-applied the RAM-100 coating using Graco equipment and Atlas Copco and Ingersoll-Rand compressors in the field SAFETY CONSIDERATIONS: » Wore a variety of personal protective equipment (PPE), including safety glasses and dust masks, when necessary » Used special permits and strict safety measures when working and operating on private property Because the first step of the job was done in house at the manufacturing plant, weather was not an issue for this 43- to 63-person crew, which depended on the task.